Card shopping. In general, I find it heartwarming that people have a tool to articulate things they wouldn't have words for themselves. Plus, it sometimes means you get mail, which is basically my favorite thing ever. My mom and my aunt are both extremely thoughtful card shoppers, and my mom will browse the whole section before she picks the card she wants. It's pretty cute. 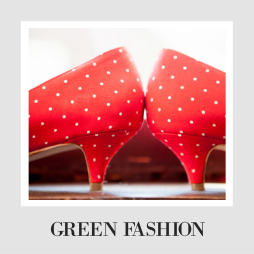 In terms of environmental-friendliness or All-American shopping, they can be a trickier deal. When you look through cards at a store, you may not be likely to look on the back to see where it is made or to see if the paper is recycled, but trust me, it's worth it. The cards most jacked up to get your attention, with noise or pop ups or extra doodads, are probably made in China. Bummer. Also, did you know button batteries in cards are baby death machines? They are the things nightmares are made of, but I digress. 1. You are already reading the card. Just turn it over and read the back. 2. You can find good options in most card sections. 3. It's easy to spot the cruddier companies. Look for a red rose. American Greetings is one of the major card companies in the United States, second only to Hallmark in sales. And they claim to be the largest in the world. It makes sense. You can find them everywhere.The offices are based in Ohio, but the rest of the story isn't as simple. Ironically, despite their name, the company is not made in America at all. They must mean American Greetings from China. This company, that also makes gift bags and wrapping paper, has moved all of it's manufacturing to keep prices cheap. So many questions. Cheap, but at what cost? How many trees really need to come down for you to send your cousin a birthday card? How far is too far for shipments of greeting cards to travel? Why call your company American Greetings if you aren't American at all? On their website, the company describes their "mission" as to make the world a more civil place. Nice, who can disagree with that? Except, they don't mention one word on how the people who make their cards are treated. Or how they treat the environment. When looking at all of those little actions that make up who they are, it becomes clear that they aren't following their own mission, it's just a bunch of empty feelgoodery nonsense. This exact machinery of capitalism, where we say we want people to be kinder to each other while knowingly stomping on others, is a huge part of why incivility and competition has taken over our culture, and I am ready to see a change. SO MANY GOOD OPTIONS EXIST! HUZZAH!!! 1. St Jude Fundraiser Cards- St Jude's Ranch is a place for children and their families to recover. To raise money for this very important space, they recycle donated cards (gluing old card fronts on new cardstock) and sell them to make money. Can you think of a better way to buy cards? Even better, you can donate all the cards you have kept to them! Check out their website here. 2. Arbor Day Give a Tree Cards- I absolutely love this idea. You can buy greeting cards (I think made on all-recycled paper? I read that before but can't find it now), and for every card you buy, they plant a tree. So you could buy your Christmas cards in bulk and celebrate the season by helping plant trees! It is such a cool idea, because these cards can cut down on waste and help make the Earth that much cleaner and healthier. 3. Make the Card Yourself- We bought a bulk pack of recycled kraft paper cards, and I have used them for everything from little notes, thank you cards, even our son's first birthday invitations. We bought a pack of alphabet stamps, and we will use the same stuff over and over again. No trees are coming down for our cards, and hopefully we are making a lot less waste. Plus, it is pretty fun to come up with ideas and work on them together. 4. Etsy Cards- Etsy has so many cards, funnier and sillier and sometimes more touching than anything you can find in stores. You can search for a card perfectly personalized to the receiver. They have 400,000 choices of cards on that site, so there isn't a chance I can cover them all here. I bought my hubby this gem for Father's Day and this one just because. Five more great sources for Made in America and recycled greeting cards on Etsy- Le Sentiments, Alluring Prints, Bubby and Bean, Creature Comforts NYC, and Live Beautifully Paper. 5. 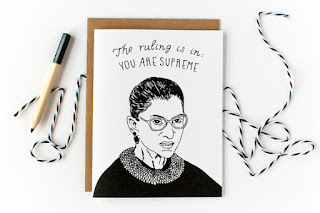 Maggie's Quill- These Maggie's Quill cards are not just hilarious, but they are made in the US and out of recycled paper! You have so many good choices for cards, there is really no reason to buy something Made in Elsewhere or with fresh paper. Recycled paper is best! And if all else fails, most (but not all! Nothing with batteries or extra doodads) Hallmark cards are still made in the US. This company did move some manufacturing away, so please check the back. Every card will tell you where it was made somewhere on there. 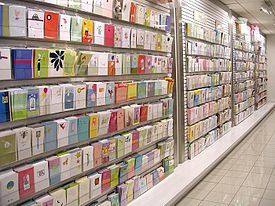 If you are going to rush shop a card in a pinch, I think you are better off starting with Hallmark cards than many of the other cheap brands at places like Walmart or Walgreens. Want more shopping inspiration? 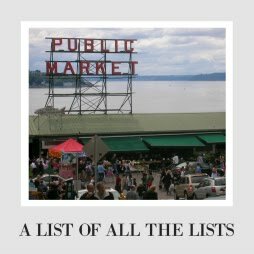 Check out my Giant List of Shopping Lists.